Tucson, Arizona – Since the day Henry Ford rolled out the first Model T, there has never been a standard in the USA for testing and replacing vehicular brake fluid. Does brake fluid last forever then? 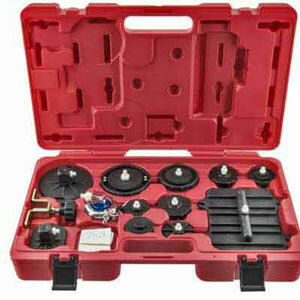 Brake fluid does not last forever, but when to change brake fluid has for years been a question with no ready answer. In an age of regulation and standards, how does such an important fluid escape a recommended service interval? There was no available technology to reliably monitor brake fluid condition until the patenting of BrakeStrip Technology by Phoenix Systems of Tucson, Arizona. Copper in brake fluid, a key predictor of corrosion, is the basis for BrakeStrip Technology. 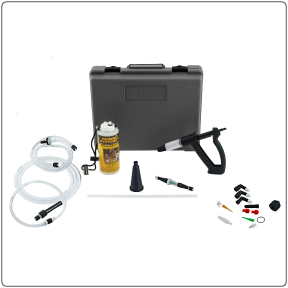 With BrakeStrip Technology, Phoenix Systems found a way to quickly and visually determine the overall condition of brake fluid as a means of predicting when internal brake system corrosion may occur and therefore when brake fluid should be replaced. The National Highway Traffic Safety Administration (NHTSA) report on “Preliminary Investigations Into Corrosion in Anti-Lock Braking Systems”- NISTIR 6233, supports the basis of BrakeStrip Technology. In May of this year, the Motorist Assurance Program (MAP) made history by adopting the first automotive standard and guideline for brake fluid replacement. The MAP guideline acknowledges that testing copper levels in brake fluid is the most effective means for determining when corrosion inhibitors have become depleted and when brake fluid should be replaced. MAP evaluated over five years of BrakeStrip field testing, the NHTSA commissioned study, as well as a number of reports published by the Society of Automotive Engineers, as the technical basis to require that when copper levels in brake fluid exceed 200 parts per million (ppm) the fluid should be replaced. MAP, along with other industry participants, develops automotive industry guidelines called Uniform Inspection and Communication Standards (UICS). These guidelines provide a procedure for communicating the results of a vehicle inspection and properly alerting the customer to what degree the repairs/replacement on the vehicle are required or only suggested. 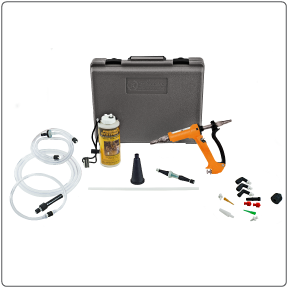 Automakers and brake fluid manufacturers have long understood that exposing the various metal parts of a brake system to hydraulic fluid causes internal corrosion to occur over time. That is why brake fluid incorporates anti-corrosion compounds in their formulations to combat this reality. With the development of Anti-lock Braking Systems, what was once considered a non-issue has turned into a real concern. Because fluid circulates through the ABS system when it is activated, corrosion contaminants can quickly spread throughout the system; in time building up to levels affecting important metal parts and clogging critical components. The challenge faced by vehicle owners is that corrosion inhibitors break down over time and at varying rates, depending on a range of factors. The only truly effective way to determine the condition of anti-corrosion compounds in fluid, at any point in time, is to test it for levels of copper. FASCAR – short for “Fluid Analysis by Stimulation of Copper Alpha Reactions” – utilizes a color change technology that responds proportionately to copper ions in brake fluid. The BrakeStrip Rating System uses a color scale indicating the amount of copper present in brake fluid from 0-300 ppm. The white reaction pad of a BrakeStrip test strip will change, within about sixty seconds, to varying shades of purple dependent on the copper level in the fluid. The strip will retain that color for at least 30 days. If there is no copper in the fluid the pad will remain white. When the BrakeStrip Rating System indicates that copper levels exceed 200 ppm – according to MAP guidelines– “the brake fluid does not meet design specifications” requiring replacement with correct fluid. This means that even though the fluid is still capable of stopping the vehicle, it must still be replaced. Research conducted in the development of BrakeStrip Technology indicates that vehicle owners should closely monitor fluid once it reaches 100 ppm, as corrosion can very quickly accelerate to 200 ppm. Research to date, on corrosion rates in ABS, suggests that brake fluid should be tested for copper levels after about twenty months in service and thereafter, about as often as the vehicle’s recommenced oil change or every three thousand miles. BrakeStrip Technology was developed by Phoenix Systems of Tucson, Arizona and is available to professional technicians, under the BrakeStripDip® brand name, through distributors across the country. 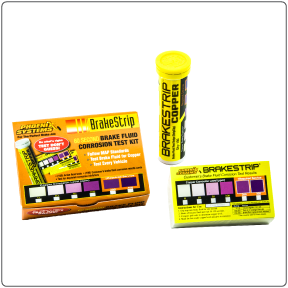 The BrakeStrip Testing Strip provides automotive technicians the quickest, most accurate visual test to determine whether a customer’s brake system should be flushed and its fluid replaced.